U-2834 automatic mechanical, modified and personalized to U-BOAT specifications, with stem position at 9 o’clock. Hours, minutes, sweep seconds, date and day. Naturally aged bronze, 46 mm diameter. Distinctive crown on left side with patented protection device. The bezel and case back are locked together by external tubing and a customized key that ensures total waterproofing. Personalized silver rotor consisting of a base and three bridges fixed with blue screws. 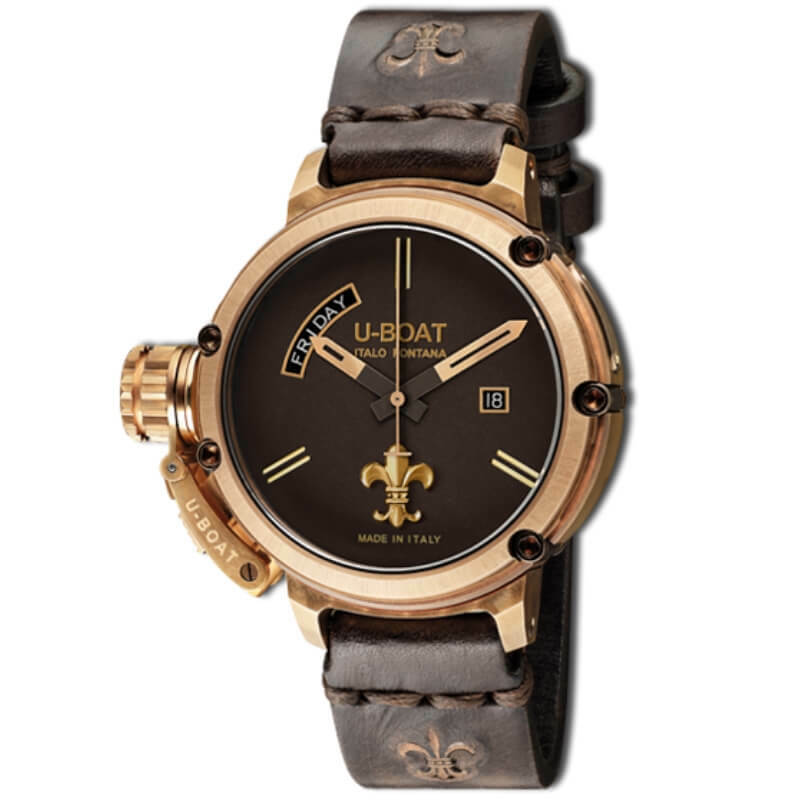 Two superimposed dark brown dials with applied fleur-de-lis. Laser cut hour and minute hands, hand brushed on the surface, hand painted central joint. Bronze colour second hand, hand brushed. Curved sapphire glass on the face and flat on the back of the timepiece with a smoked effect. Calf leather strap with applied bronze fleur-de-lis. Handmade and hand-finished, with bronze tongue buckle. Width 20/22 mm, hypoallergenic and color retention treatment. Fastened to the case with screws.